This little gambrel-roofed brick structure was the first Presbyterian church built in Wilmington. It was completed in 1740 and that date is outlined in glazed brick on the north wall of the building. 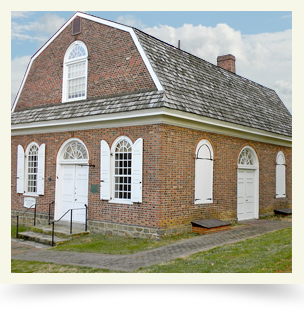 When the British occupied Wilmington after the Battle of the Brandywine (1777), the church was used as a hospital for their wounded soldiers. From I-95 take Delaware Avenue Exit, follow to West Street to Park Drive.